LINDISFARNE was born in 1970 when Newcastle singer-songwriter Alan Hull joined Rod Clements, Si Cowe, Ray Jackson and Ray Laidlaw, collectively known as Brethren (formerly the Downtown Faction blues band). The new combination’s music, an immediately distinctive blend of Alan’s poetic lyricism and Brethren’s rootsy instrumental style, soon came to the attention of independent label Charisma, and their first album, Nicely Out Of Tune, was released before the year was out. Although initial sales were slow, Nicely Out Of Tune was acclaimed by the metropolitan media who regarded the unpretentious style of the Tyneside tunesmiths’and their effortless connection with their audience as a breath of fresh air in a jaded scene. The album contained several future Lindisfarne classics – Lady Eleanor, Road To Kingdom Come, Winter Song, Clear White Light and We Can Swing Together (all still staples of the band’s live set) – and paved the way for a major breakthrough the following year. The media buzz surrounding Lindisfarne attracted legendary American producer Bob Johnston (whose credits included albums by Bob Dylan, Johnny Cash, Leonard Cohen and Simon & Garfunkel) to work on the follow-up, and the result – 1971’s Fog On The Tyne – brought the success so many had predicted. The first single released from the album (the Rod Clements-penned Meet Me On The Corner) charted at number five, propelling Fog to the top of the U.K. album chart antd securing its place as the top-selling U.K. album of the year. Meanwhile Lindisfarne were headlining nationwide tours (supported by upcoming young hopefuls such as Genesis) and making extensive forays into the U.S.A. and Europe, their direct, unconventional approach to live performance unchanged from the early days, to the delight of audiences everywhere. It was during this heady period that Lindisfarne earned their reputation as a festival band following their barnstorming appearances at the now-legendary Weeley Festival (Essex) and Bardney (Lincolnshire), sharing the bill with The Byrds, Talking Heads and – further down the pecking order – a young drummer named Paul Thompson with his new band Roxy Music. 1972 saw Bob Johnston back in the producer’s chair for Dingly Dell, Lindisfarne’s ambitious third album and another Top 10 entry in the U.K. album charts. But relentless touring and high expectations from the business and media were taking their toll, with Alan particularly feeling that his songwriting was compromised by the band’s success, and an Australian tour in early 1973, co-headlining with Slade and Status Quo, proved to be the original band’s swansong – at least for the time being. Following the release of his long-anticipated and well-received solo album Pipedream, Alan and fellow frontman Ray Jackson formed a new Lindisfarne (including Charlie Harcourt on guitar), while Rod, Si and Ray Laidlaw brought in old friend Billy Mitchell to form Jack The Lad. Both bands enjoyed success at home and abroad, but events took an unexpected turn when promoter Barry McKay persuaded the original lineup to reform for a Christmas concert at Newcastle City Hall in 1976. The demand for tickets quickly led to a second show and the following year an even more successful rerun at Christmas 1977, Lindisfarne announced they would continue on a permanent basis under Barry’s management. Returning to the studio in 1978 with Gus Dudgeon (Elton John, David Bowie) producing, Lindisfarne re-established themselves with Back And Fourth and another Top 10 single – Alan’s anthemic Run For Home. With renewed chart success and an enviable reputation as a live act second to none, the band embarked on further sold-out headline tours (with such young hopefuls as Chris Rea and Chas & Dave in support). In the face of New Wave and a world of ever-changing musical fashions, it was to live performance that Lindisfarne increasingly turned – still writing songs and releasing albums of new material, remaining true to their inspirational roots and returning to Newcastle each December for the now internationally famous City Hall Christmas Shows. Along the way there were further high-profile festival appearances including Cambridge, Cropredy and Glastonbury. The lineup grew to include Marty Craggs on saxophone and vocals, and following the release of Dance Your Life Away in 1986, producer Steve Daggett came in (on keyboards and guitar) to help replicate that album’s wider soundscape. Further changes saw both Ray Jackson and Si Cowe dropping out to pursue interests outside music, and in 1989 Rod moved from bass to guitar, necessitating the recruitment of a full-time bass player – first Steve Cunningham, then Ian Thomson who remains with the current lineup. Another addition was a young Tyneside guitarist, Dave Denholm, who would play a significant role in Lindisfarne’s further evolution. An unexpected and unwelcome change, however, came in 1995 with the sudden death of Alan Hull. At the time he was recording a solo album, Statues And Liberties, working in close collaboration with Dave Denholm, who saw the project through to its release the following year. Inevitably it took some time for Alan’s bandmates to absorb the loss of a founder-member, front-man and principal songwriter but they decided to celebrate the legacy of Alan’s music and their original ideals through continuing to perform; Billy Mitchell accepted an invitation to join, and the new lineup hit the road in spring 1996. Two further studio albums followed, Here Comes The Neighbourhood (1998) and Promenade (2002), the bulk of the new songs now written by Rod, sometimes in collaboration with producer Nigel Stonier. Lead vocals were mostly taken by Billy, with increasing contributions from Dave and Rod. Dave’s natural vocal resemblance to Alan Hull – enhanced by their work together on Statues And Liberties – was used to telling effect in the new live versions of Alan’s songs. Another link was created when Dave married Alan’s daughter Francesca, changing his name to Dave Hull-Denholm in the process. This incarnation of Lindisfarne finally dispersed in 2003 following an emotional farewell concert at Newcastle’s Opera House (recorded, filmed and released as Time Gentlemen Please) and for a time it seemed the story was over. In November 2005, former Lindisfarne members and associates appeared together at Newcastle City Hall at a special concert to mark the tenth anniversary of Alan’s death. Public interest in his and Lindisfarne’s work was heightened when former manager Barry McKay mounted a campaign to recognise Alan’s achievements with a plaque outside the building, now threatened with closure. At the plaque’s unveiling ceremony, a brief musical tribute was performed by Ray Jackson, Dave Hull-Denholm and Ian Thomson. ‘Jacka’ expressed his commitment to saving the venue and – enlisting the services of Steve Daggett, Charlie Harcourt and Paul Thompson – formed ‘Ray Jackson’s Lindisfarne’, which performed at a successful series of City Hall concerts in December 2013 and 2014, recreating the Christmas shows in their eighties heyday. Following Jacka’s subsequent retirement, Rod Clements accepted an invitation from the others to join them in re-establishing their collective identity as Lindisfarne. 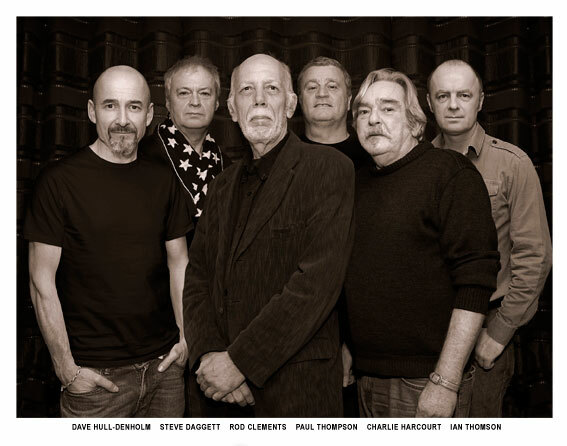 As Ray Laidlaw once said, ‘Lindisfarne is more than any one individual’; and though members have come and gone, Rod’s return maintains continuity with Lindisfarne’s beginnings and reinforces their shared commitment to keeping alive the unique legacy of one of British rock’s great bands.